The Maine Warden Service Dive Team uses a side scan sonar off the front of their dive boat while searching the Androscoggin River between Lewiston and Auburn, Maine, for a missing 5-year-old boy, Friday, April 27, 2018. A kayaker found the boy's body on May 14, 2018. 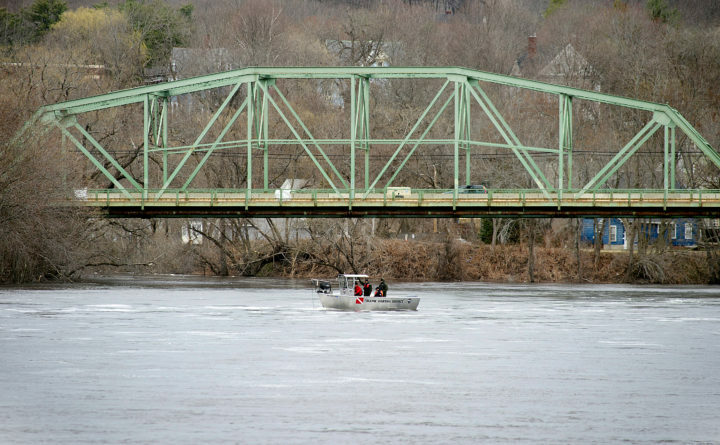 A kayaker on Monday discovered the body of a 5-year-old boy who fell into the Androscoggin River late last month, ending an extensive 20-day search to find him. Christopher Lane, who for two decades has worked as a kayak instructor for L.L. Bean, found Valerio McFarland’s body just before noon in Durham. Lane, a certified Maine guide, found the boy’s body about five miles from where he fell into the current in Auburn while playing along the riverbank with his older brother, Maxim, on April 24, prompting a massive search effort by multiple state and volunteer agencies. Lane had been invited to join some L.L. Bean colleagues in the search on Saturday, but was unable to go, he said. Instead, he decided to go out alone on Monday. As a parent of six children, the prospect of bringing Valerio’s parents some closure outweighed the tragedy of finding him. He was only out in his sea kayak for about 45 minutes when he spotted what looked like “a kid looking underwater” near an oak tree dipping into the water near a bend in the river, he said. Lane stayed with the body until the Maine Warden Service arrived 45 minutes later. “I hate to bring such bad news to the family, but at the same time, I think that’s what they really wanted and needed — was that closure,” he said. He was right. “We were able to see him and hold him,” Helena Gagliano-McFarland and Jason McFarland, Valerio’s parents, wrote in a Facebook post Monday. “We are thanking all volunteers for their immense help in finding him. We couldn’t have done it without you all. God has heard our prayers,” they wrote. The night the boys fell into Androscoggin, they had been playing near the footbridge of Bonney Park when they ended up in the river. They were swept away by a strong current at about 7 p.m.
Their father and 8-year-old sister, who were nearby, tried to rescue them, police said, but were unsuccessful. About 20 minutes later, at 7:19 p.m., a rescue team of Auburn police and firemen pulled Maxim from the river near Gagne & Sons Concrete on Riverside Drive in Auburn, Asst. Fire Chief Chip Keene said. Maxim was taken to Maine Medical Center in Portland and was initially listed in critical condition, but his parents — who had recently moved to Auburn — have since said that he will make a slow recovery. Auburn police suspended the search for Valerio on April 26, leaving the effort to be handled by volunteers and the Maine Warden Service. That search was carried out by planes, drones, divers, dog teams and people on foot, said Richard Bowie, director of DEEMI Search and Rescue, whose mostly volunteer-led organization helped coordinate the search. The body had likely evaded searchers for so long because the murky water had obscured it from view as it stayed near the riverbed, preventing it from showing up on polarized photographs taken by air, he said. Sunday night, something must have loosened it and allowed it to drift toward the Lewiston side of the river, he said. After he found Valerio, Lane spent the day with his family — including his 5-year-old.